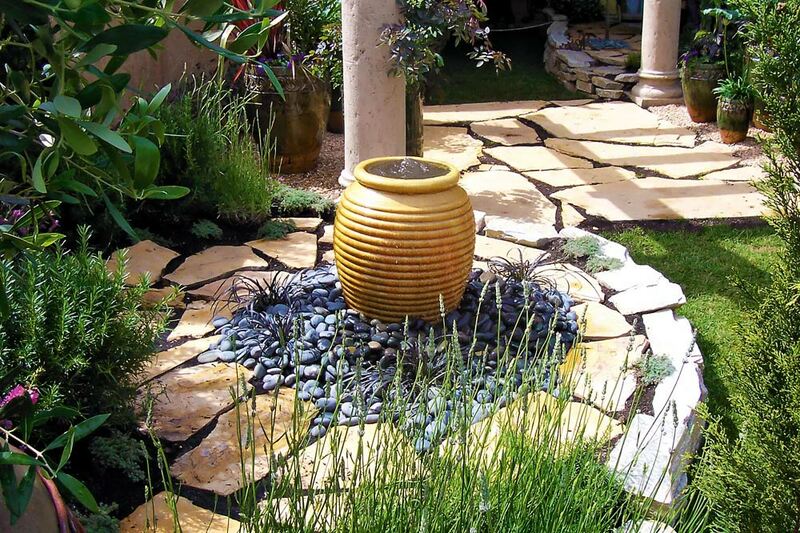 Gravel patios or “terraces” are an outdoor element used in home landscapes in Europe for many centuries. 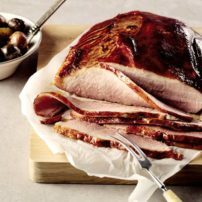 Elegant and natural, they are typically made of crushed indigenous stone, widely used for many years because it was a readily available and inexpensive material. The look is an easy surface tamped to flatten and harden the terrace “floor.” The romantic look of a gravel courtyard strikes a different thought than the typical use of gravel in American landscapes. Gravel tends to only get used as a utilitarian element. It fringes the edges of roadways, makes drainage swales and scatters into a cheap alternative to an asphalt driveway. Rounded Mexican pebbles add a calming touch to this Asian-themed garden. 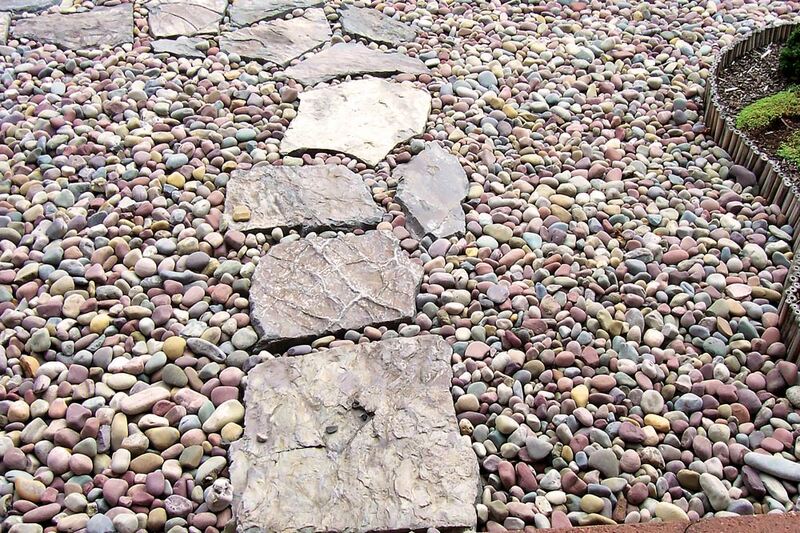 Let’s look at gravel in a more creative light to see how it can create texture and beauty used in patios, pathways and as mulch over planting beds. 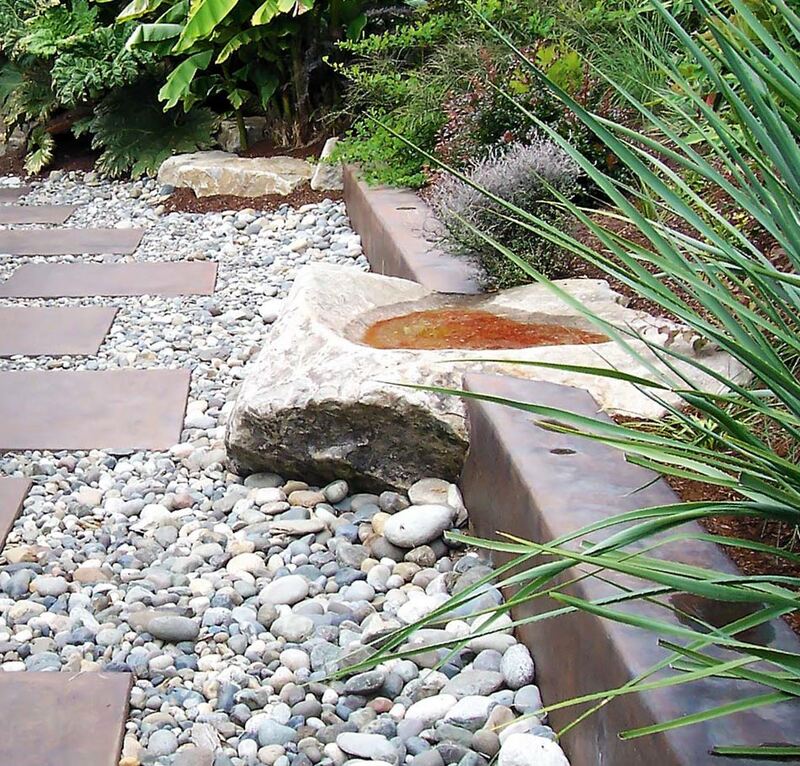 The use of rock sets a mood and style, from a natural landscape of ornamental grasses to a Mediterranean or Japanese style. 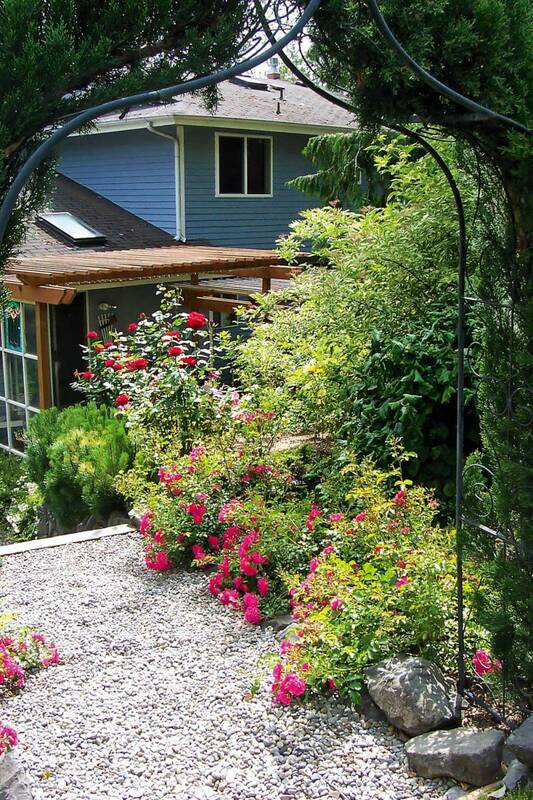 Color and different sizes of stone add a whole new effect to the hard- and soft-scape of a garden. The European influence of a gravel patio is an elegant design element for a French country or Mediterranean style courtyard that bathes in warmth, surrounded by sun-loving plants. A cost-effective alternative to natural stone, crushed gravel can be used where a large amount of patio stone is prohibitive. 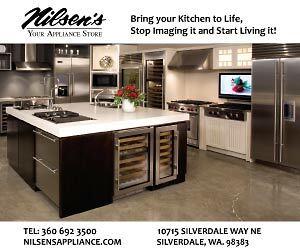 It creates just about any shape for flexibility in design. Combinations with other stone, such as a brick edge or large pieces of natural flagstone, add dimension and texture that go beyond the simple use of gravel as a hardscape. Tradescantia ‘Maiden’s Blush’ puddles along a gravel walkway. A good choice for informal pathways through the garden, crushed gravel creates a look that blends into naturalistic garden styles. 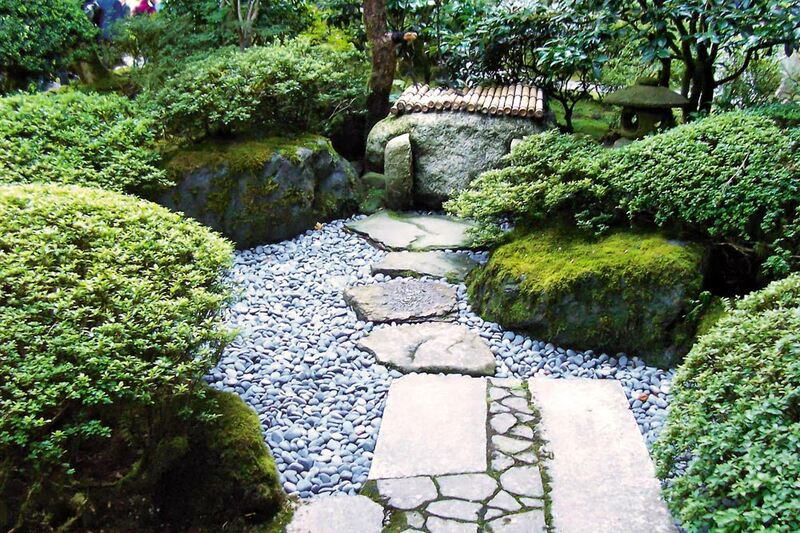 The loose rock conforms to any shape, useful for a path that changes width as it meanders. 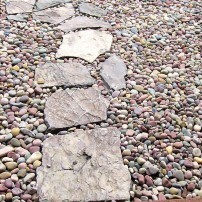 Pathways will need a hard edge like a line of rock or brick to keep them from splaying and moving off the paths. Choose a size of rock 1 1/2 inch or less, or the rock is hard to walk on. 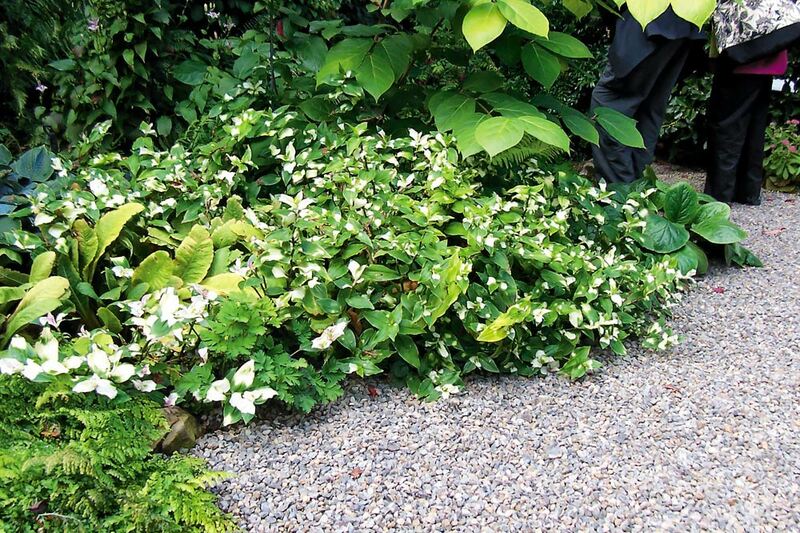 If plantings are completely mulched in gravel, the pathways exist in open spaces and the planting design can direct the walkway without a hard edge. 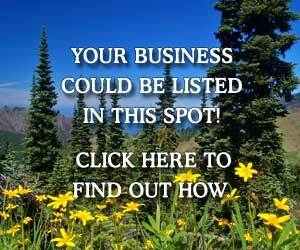 It creates organic movement through a garden space. 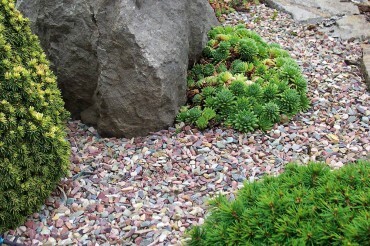 Sedums and “Rainbow chip” mingle with dwarf conifers. 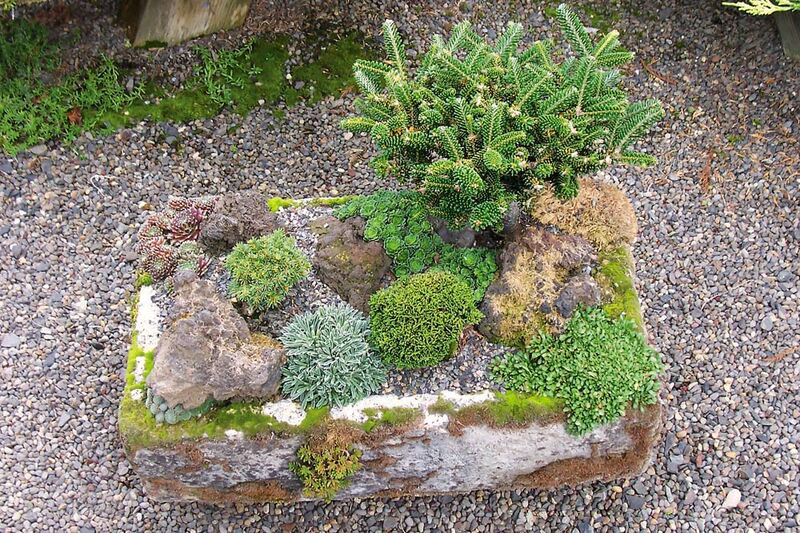 Gravel and rockery are essential elements in a garden that is stylized with a Mediterranean or alpine feel. 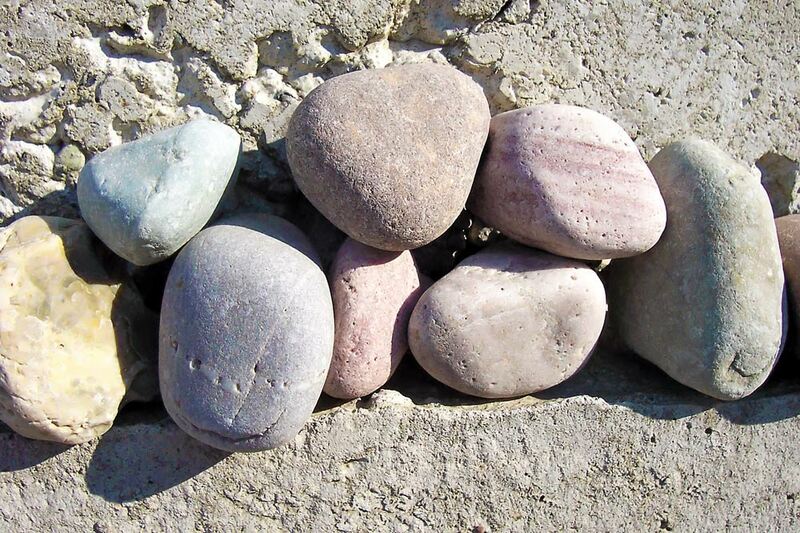 Use colored gravel to play out style, match it to a decorative element in the garden, such as the color of existing patio stone or pottery. 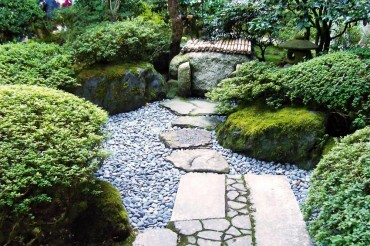 The structure and shape of paths or beds can also create a contemporary feel with the help of strong lines and bold edges typically seen in Asian garden designs. 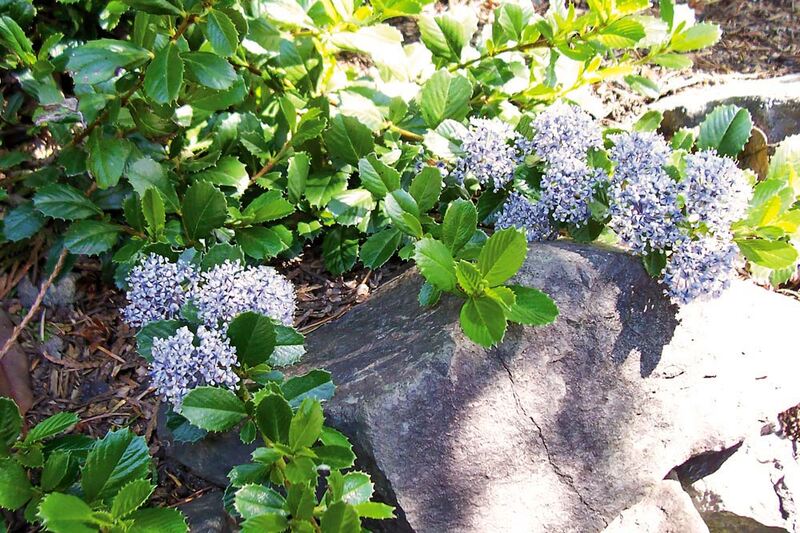 Imagine white or salt-and-pepper rock as a groundcover around large boulders or bold-colored pottery. A bonus to using gravel in a Pacific Northwest garden is that it creates a quick draining surface through wet winters that won’t leave puddles or mud along pathways and patios. 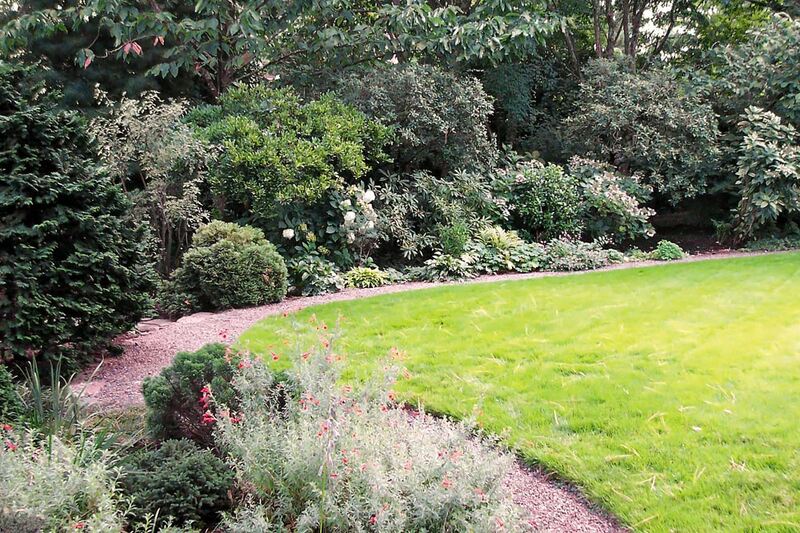 A gravel path draws elegant lines and finishes the edge of a lawn. Gravel, cobblestones and large placement rock can be used as design elements to hide flaws or utility areas in a garden. 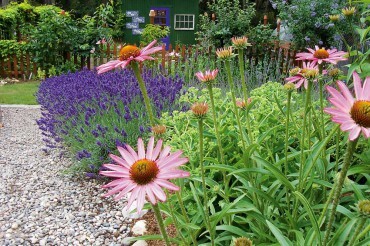 Use loose rock to cover septic lids and in-ground utility boxes as part of a gravel garden. 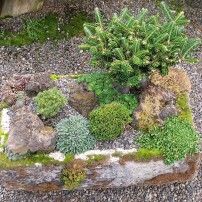 Plants can be used where the soil is, while the lids are covered with attractive rock, yet still accessible as needed. 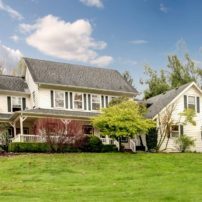 Flaws in ground levels can easily be smoothed out with the use of gravel. As the gravel is raked and leveled, it fills in small holes, eliminating the labor of ground leveling everything before laying a surface. Design attractive rock features in low-lying areas to correct drainage. 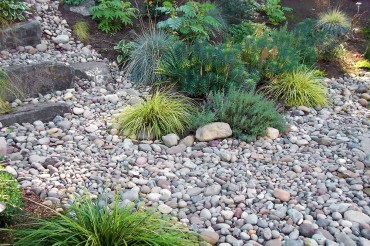 The spaces of rockery and gravel allow water to drain through rapidly or be directed away from other areas. 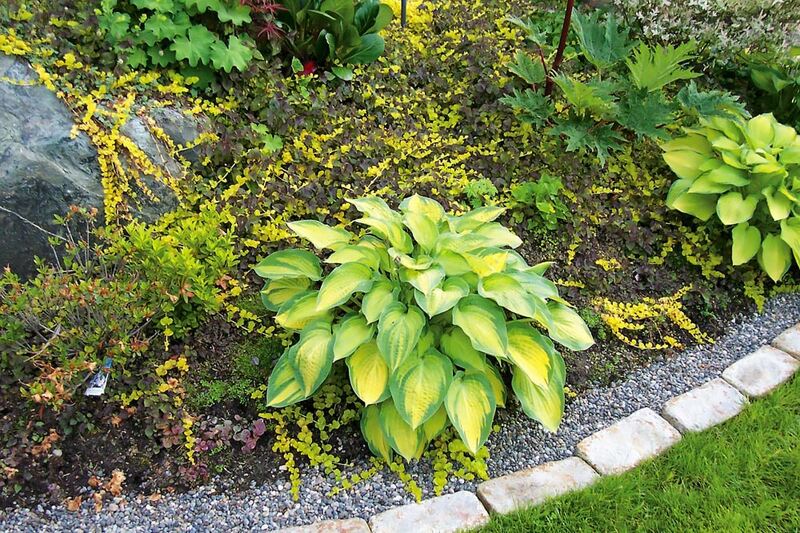 A fully mulched area of gravel interplanted with water-wise plants is the classic “gravel garden.” It is low-maintenance and has little water needs. 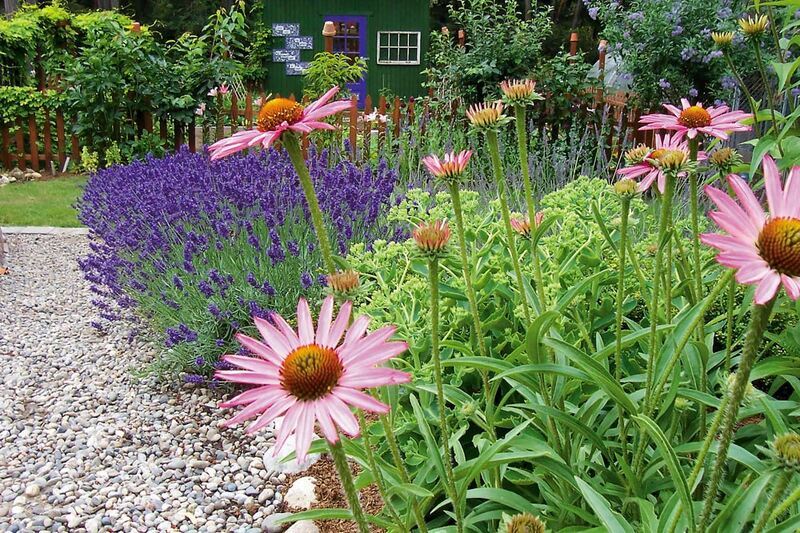 Gravel smoothes a surface out and allows an easy technique to integrate a hard surface with a soft surface because plantings can be put in it almost anywhere. Beth Chatto, a British garden designer, has popularized the term “gravel garden” with her public display garden (www.bethchatto.co.uk). 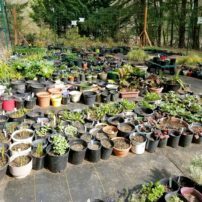 In a miserable corner of her garden, a former parking area was magically transformed into a garden of drought-tolerant plants, mulched in gravel and reliant on only natural rainfall. 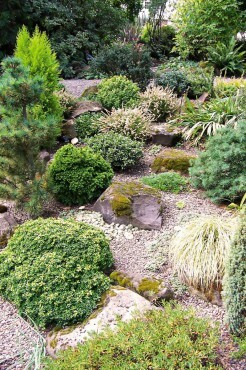 Gravel gardens allow a wide range of ornamental yet tough plants to be grown. Most drought-tolerant plants are best suited for a full-sun spot, which is hard to water. 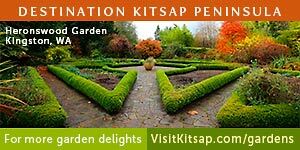 Plants are placed so that gravel can be raked up to their crowns without covering them, creating mulch that provides a well-drained surface against the undersides of dry-loving plants. 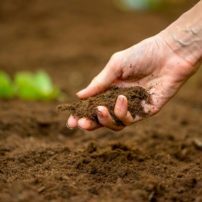 Mulch with at least 3 inches of gravel, any less and soil will show through and look more a “mess” than “mulch.” A good size rock for mulch is 5/8-inch clean crushed aggregate. A side benefit to gravel is that slugs won’t cross chipped and rough gravel and cats will not use a gravel mulched flower bed as a litter box. 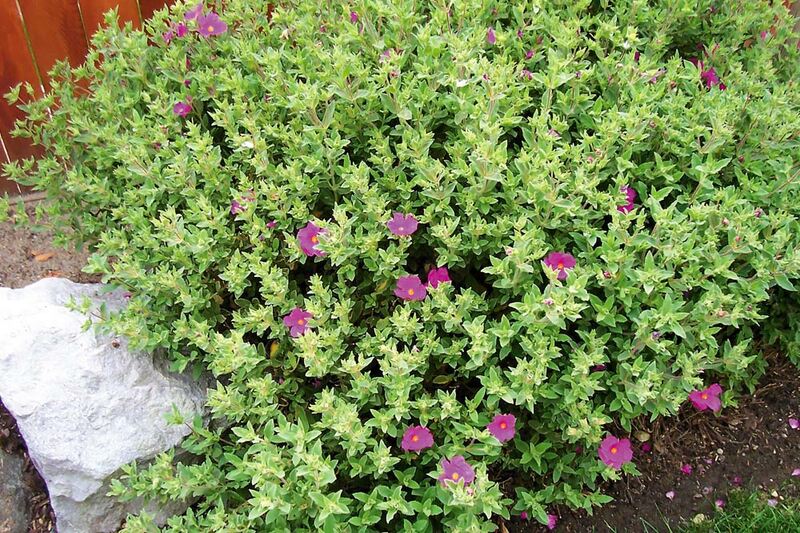 The plantings in a gravel garden rely on the bone structure of drought-tolerant evergreens and tough shrubs, and perennials such as lavender, rock rose (Cistus sp) and rosemary. 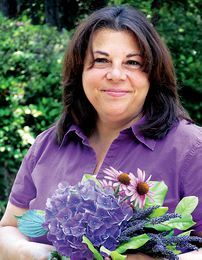 Bulbs create a wash of color in the spring; from alliums to species tulips, the sharp drainage provided by gravel keeps bulbs from rotting in heavy soil and wet winters. Drought-resistant ornamental grasses play throughout the year, from the fresh new growth in spring to the rich seed heads in the fall. Plant spacing is loose so that gravel shows through to accent the effect of the rockery. 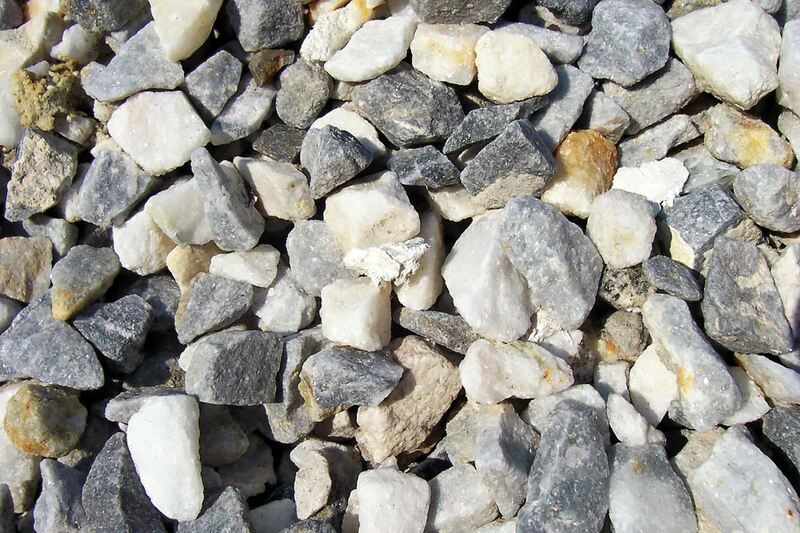 Gravel isn’t just one specific type of rock, it describes a material with rock in it that comes in different sizes and shapes. 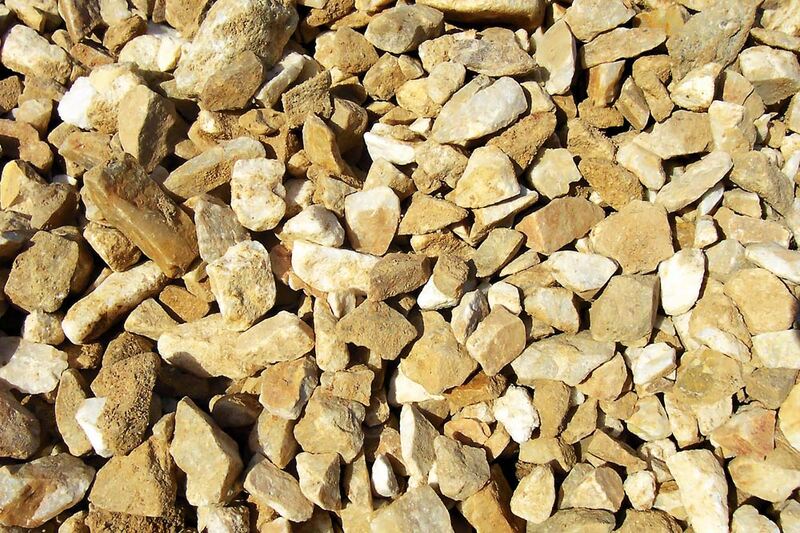 The rock is crushed, chipped, tumbled or rounded and is generally considered 1/8th-inch to 1 1/2-inch in size. 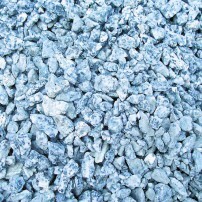 Choose the type of gravel based on its purpose. Crushed is better for areas that are walked upon because it doesn’t roll underfoot. Rounded rock has a more finished look. 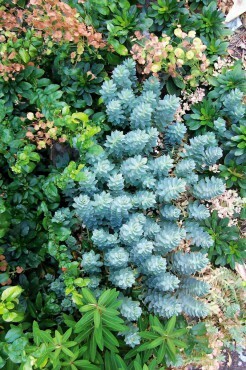 Go for some color for aesthetic and design use or to create micro climates. There is nothing like white rock as mulch around lavender plants to stop the typical wet winter browning that happens at the base where the plant stays wet against soil. 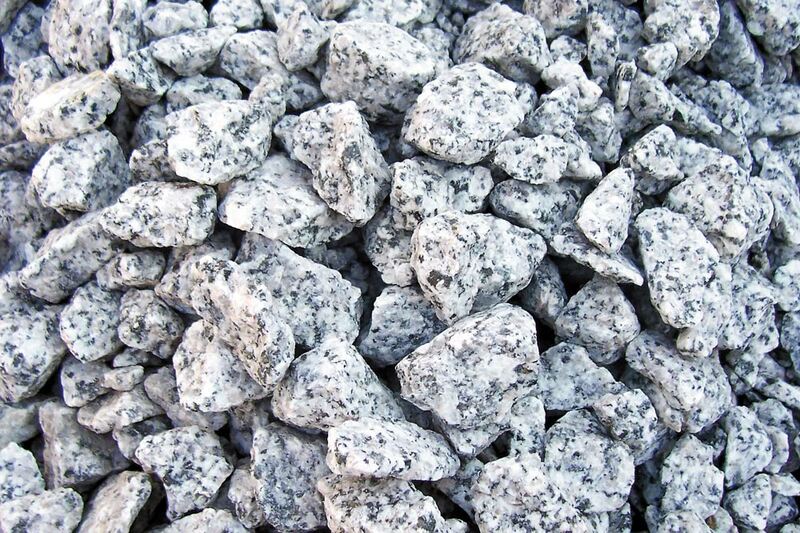 To calculate how much rock you need: One cubic yard of gravel will cover approximately 300 square feet, 1 inch deep. Total the number of square feet to cover, divide by 300 and multiply by the desired depth in inches. This will give the number of cubic yards needed. Simply means it has small particles in it. 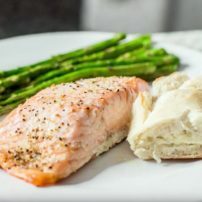 For example, a 3/4-inch minus will have nothing larger than 3/4-inch rock and will include everything smaller right down to sand in the same mix. 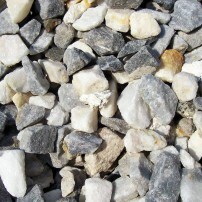 A “minus” crushed rock is good for pathways, patios and driveways since they can be tamped down to a more solid surface. 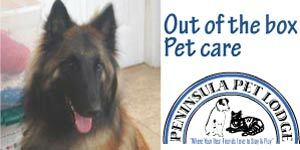 Typically 7/8- to 1 1/2-inch size. 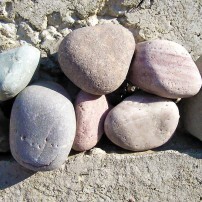 Also called washed rock, this is rounded and smooth with no small particles and more open spaces that water can drain through easily. Nice for edging along driveways and borders to direct water flow. 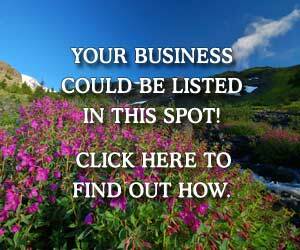 Typically refers to small, rounded river rock. 3/8-inch size. Just like it says, the size of peas, commonly used under play sets applied 4-6 inches deep. 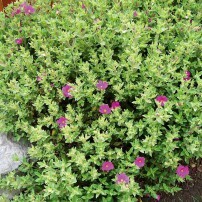 Needs to be contained with an edging or it will disappear in the dirt. 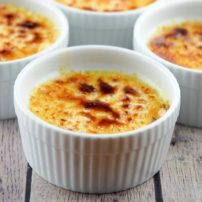 A mix of 3 to 8-inch size. Sometimes called bullrock. 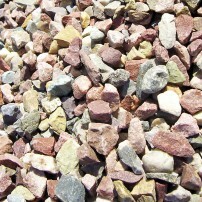 A yard of this rock will have a mixture of sizes and the rocks are rounded like they have been tumbled by a river. 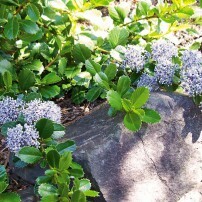 Nice for dry creek beds and driveway edges. 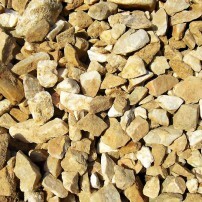 Gravel eventually starts to sink down in the soil and may need to be occasionally replenished. Typically in older gardens the base will start to thin out in heavy-traffic areas. 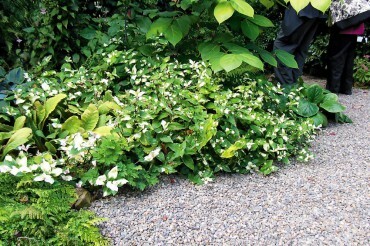 To keep the surface tidy, use a loose fan rake to remove leaves and level gravel. A tamping of the gravel surface occasionally will also help keep levels firm. A leaf blower works for dried leaves and debris when the blower is directed to skim the surface, not blown directly upon. Weeding is most intensive in the first few years of establishment while the plants are filling in. 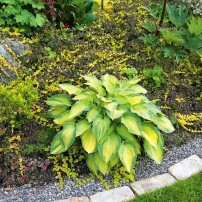 Never let weeds get away from you and creep into the gravel mulch, or they will become harder to pull. 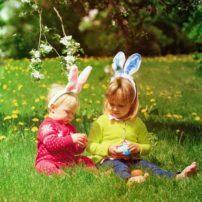 After a few years of weed-pulling diligence, it will just be a matter or removing self-seeded ornamentals and the few weeds that blow in. 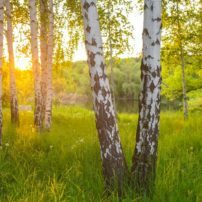 Fascinating and intimidating, landscape rock companies aren’t usually the first stop in designing a garden but the elements they sell can make or break a landscape. 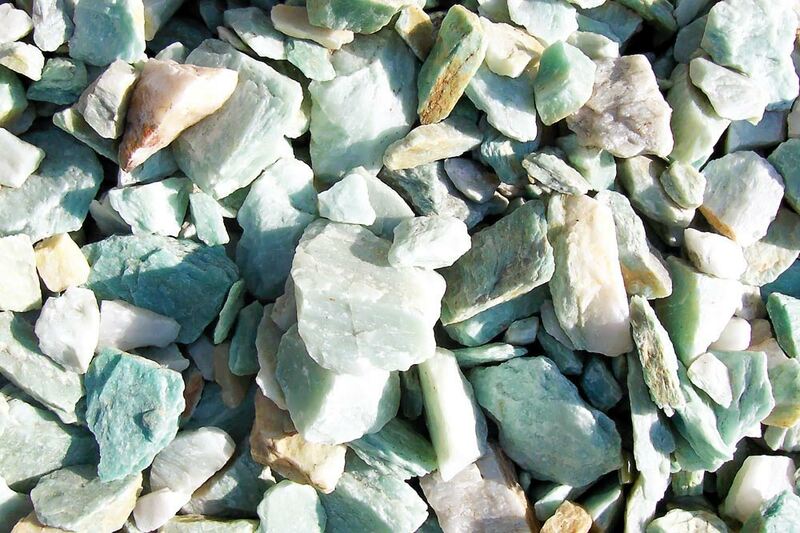 When deciding what look, color or texture you want from stone, start by making your way through the stone yard. 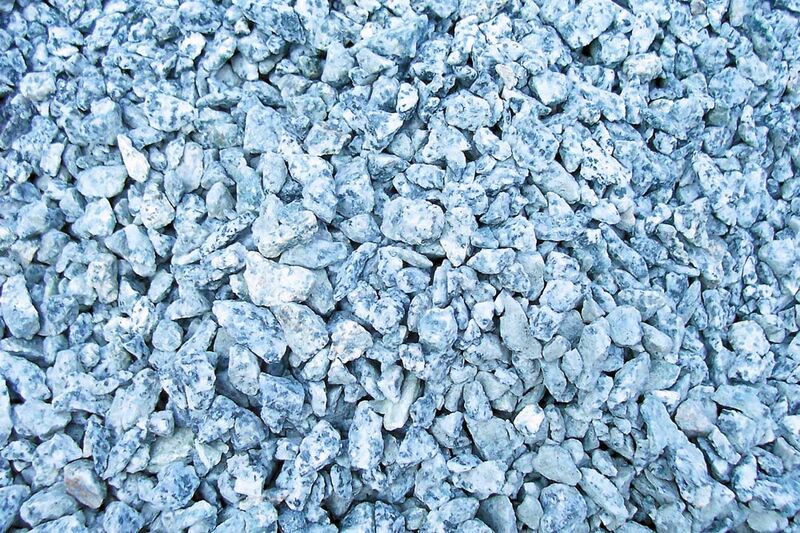 When the rock is in bulk piles, it is easy to see what it will look like in a large use as compared to looking at what is inside a bag. 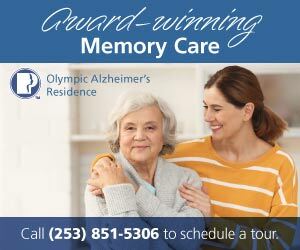 Stop in the office and grab a brochure to get a listing of available rock and prices, then head outside. Wear shoes that can get muddy and watch out for large equipment buzzing about. 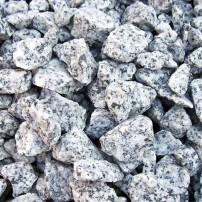 Gravel is really a generic name for small rock. 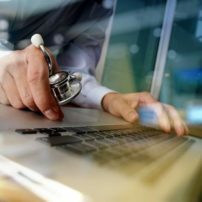 It can be crushed to a fine dust up to larger and rounded sizes. 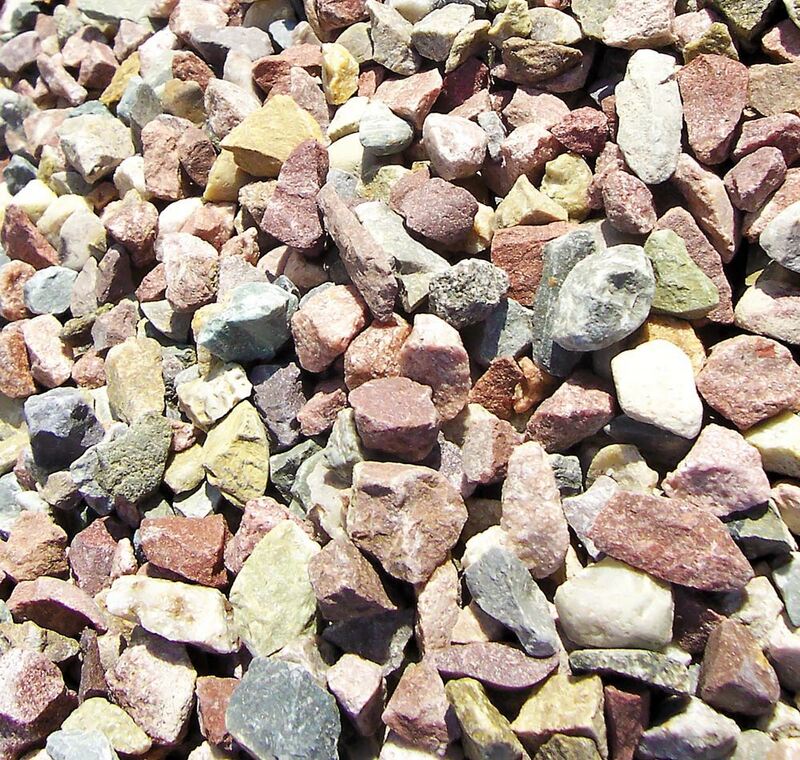 Look for specialty rock for designing texture and color in the garden; the use of specialty rock takes a new look beyond the utility one usually associated with gravel. The color comes from the geological make-up of the stone, such as granite, basalt and quartzite. 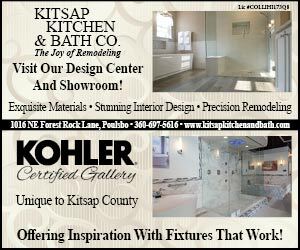 A walk through Morrison Gravel in Port Orchard will show the wide range of colors available like “Coppertone quartzite,” “Champagne,” “Turquoise chips,” “Smokey tone quartzite” and “Salt and Pepper.” As Ken Morrison of Morrison Gravel explains, his vast selection of specialty rock in stock is only the tip of the iceberg as to what is available from all over the country. “Coppertone” Quartzite adds rich warm tones. 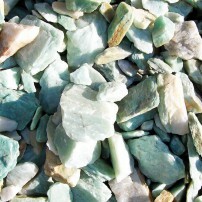 Turquoise chips shimmer a touch of green. Pavers and gravel make a tidy finish.